Han Ying, one of the first people in the city to use a guide dog, tells how her life has changed since an eye disease robbed her of her sight. In celebration of the Year of the Dog, our new series profiles the contribution the animals make in Shanghai, proving that they are not only our best friends but irreplaceable helpers in many aspects of our lives. A lot of people say that guide dogs are the eyes for the blind. But for those who live without sight, the bond between them and their dogs is much closer — the guide dogs not only help the blind to get around safely, they also encourage people to live positively and with confidence. International Guide Dog Day on the last Wednesday of April every year celebrates the important role guide dogs play in enabling freedom and independence for people living with vision problems. 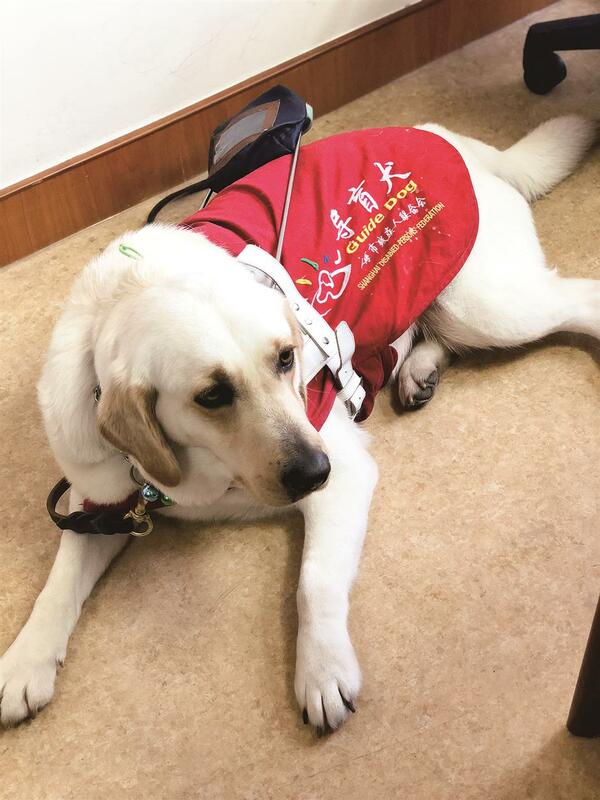 “For me, a guide dog not just helped me to travel safe and sound on the streets, more importantly she enabled me to walk a new path in life psychologically,” said Han Ying, one of the first people in Shanghai to use a guide dog. Han Ying with Ersi (right), her first guide dog, and An’an, her second. Ersi retired after eight years’ service but Han still visits her at weekends. International Guide Dog Day on the last Wednesday of April every year celebrates the important role guide dogs play in enabling freedom and independence for people living with vision problems. In 2009, Han, a young teacher who became blind due to an eye disease in 2001, became the first blind person in Shanghai to take and pass the Self-Taught Higher Education Examination. Because she had to attend classes every day, it was suggested she try using a guide dog. China only began to develop guide dog programs a little over a decade ago, and Han didn’t know about guide dogs until Lucky and Star, two of China’s first guide dogs, appeared at the opening ceremony of the 2008 Paralympic Games in Beijing. 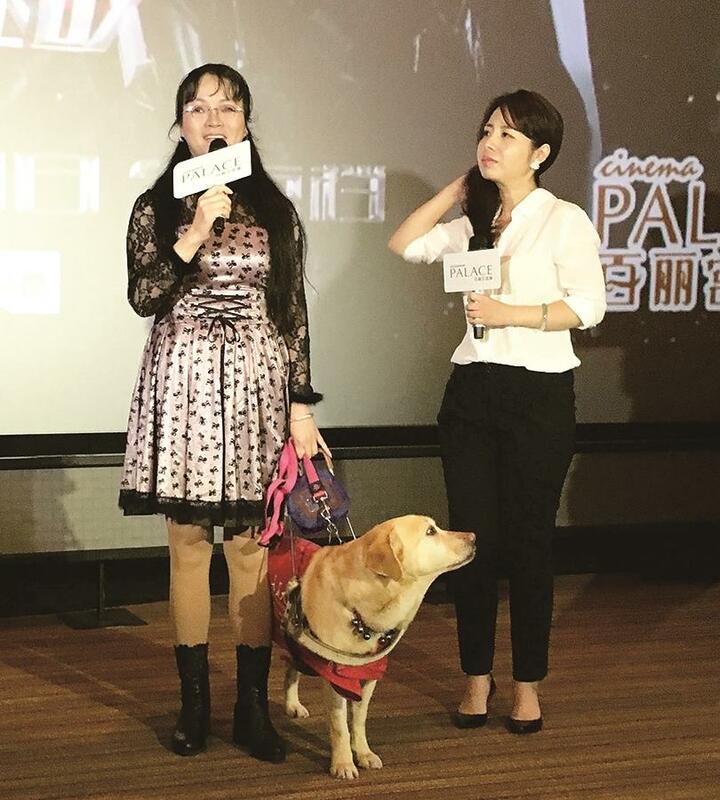 “I learned about the guide dogs in 2008 but I didn’t think too much about it, traveling with a guide dog seemed a very distant thing for me and I thought they were for famous people, but because I had to attend classes, the Shanghai Disabled Persons’ Federation suggested I have a try, and I had my first dog two months later,” she said. 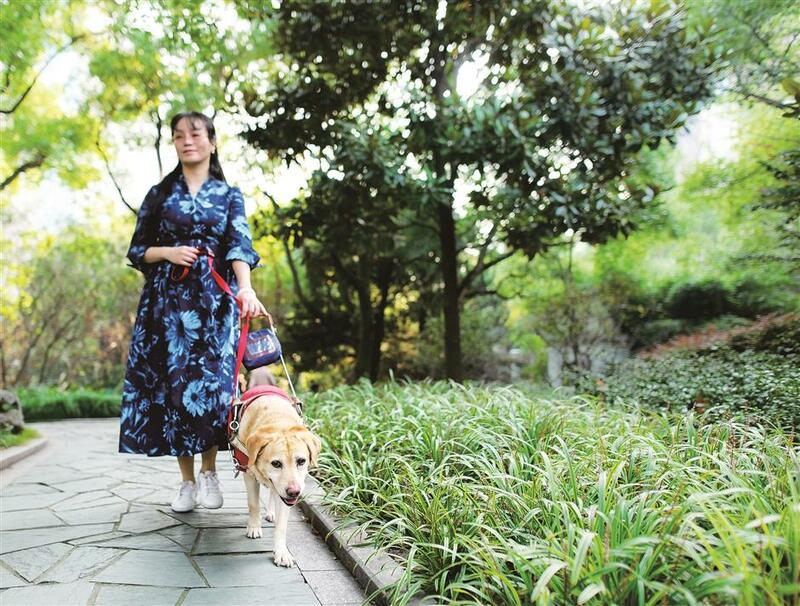 Han Ying and her guide dog Ersi take a walk in the park. Ersi was the fifth guide dog in Shanghai and served eight years before Han’s second guide dog An’an arrived in April 2017. There are several requirements when matching guide dogs with blind and partially sighted people. Having a love for animals is a must. “In order to establish a successful bond, you have to think about the dog and the dog has to think about you, I love animals a lot and back then I had four tortoises as pets,” said Han. A match in personalities is also necessary as each dog has its own and so does the user. For example, a very active guide dog may not suit someone who walks slowly and cautiously. During her three-week stay, Han had learnt the common commands, English phrases such as left, right and go straight, before she could meet her guide dog and participate in trainings to establish a bond with the animal. Guide dog An’an, a 2-year-old female Labrador, now accompanies Han every day. Ersi was quiet and gentle, and as Han petted her, she lay down. The pair then started to train side-by-side. When Han first walked with Ersi at the guide dog center, she was scared, because she had been used to walking with people. “I always walk very cautiously and I’m very afraid of the stairs, they told me to relax because the (guide) dog would match my speed, only trained dogs can accomplish this because it’s against their nature, dogs love to run,” Han said. After three weeks of training both indoors and on the street, Han returned to Shanghai on her own. Ersi would arrive later. But there was more training before the dog was hers to use. The guide dog trainer designed specific routes that Han and Ersi would walk frequently, because the dog cannot find its way like people. “I lived in Xinzhuang back then and I primarily travel from my home to the Metro station. The shortest route wasn’t safe for me and Ersi because there were at least four crossroads, so the trainer prepared a safer but longer route that took 30 minutes one-way,” Han said. Han Ying and Ersi walk out of San Francisco International Airport. In 2011, Han traveled abroad with Ersi to the United States. She flew with China Eastern Airlines. As Han started to travel with Ersi on a daily basis, she not only had to coordinate her every move with the guide dog, but also overcome psychological barriers. For a long time after she became blind, Han tried to hide the fact by pretending to have normal sight. “To be honest, there was an imbalance in mood when I first used a guide dog, not because of fear, but the attention from the other people. Using a guide dog meant I was telling the entire world that I’m blind, people who weren’t noticing you would do so by seeing a guide dog,” she said. Han knew she had to accept reality, and that was also one of the reasons she applied to have a guide dog — with no chance of regaining her sight, she needed to learn to live as a blind person psychologically. 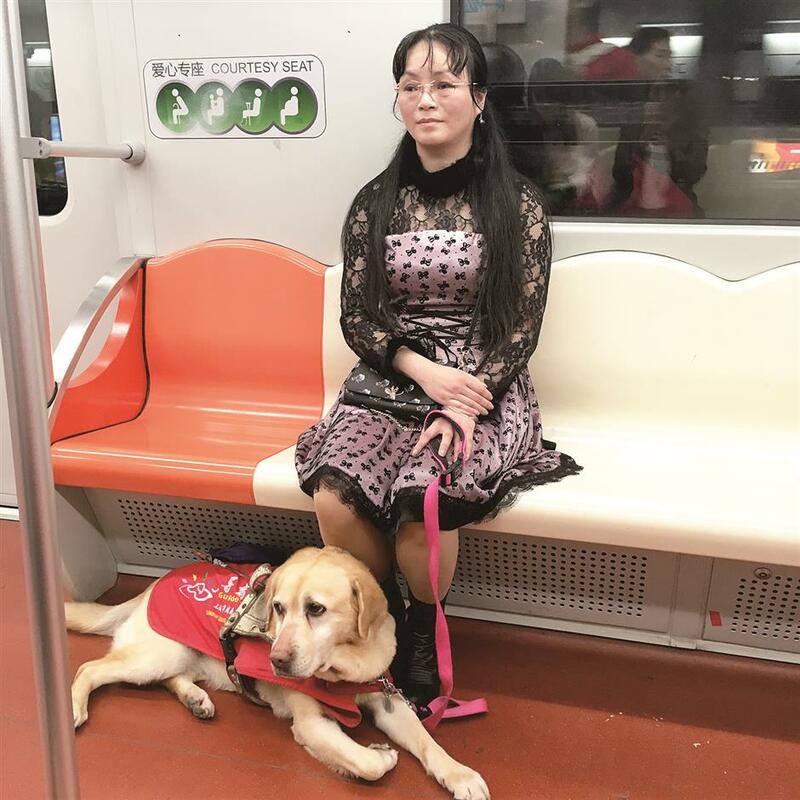 Han Ying takes subway with her guide dog Ersi. Shanghai has allowed guide dogs to take the subway since 2010. The huge pressure in the beginning made Han reluctant to leave home, and when she did travel with Ersi, it felt like she was fighting a battle. To avoid attention, she even put on Ersi’s red jacket inside out so people couldn’t see the guide dog emblem. The pair had to practice frequently before a final evaluation which would decide if Ersi could stay, so gradually Han overcame her fear and gained confidence. Guide dogs are trained to lead people on designated routes, follow directional commands and avoid obstacles. The training is so detailed that, for example, when a guide dog enters an elevator with its owner, it will immediately turn around to face the door, so the person adjusts accordingly. The users of guide dog must learn to take care of the animals, completing tasks such as feeding, bathing and even brushing their teeth. Guide dogs are fed twice daily and must follow a strict diet in order to maintain a stable status — they eat kibbles and occasionally some fruits and eggs. Guide dogs cannot play freely like other pet dogs, as they must follow rules and remain obedient at all times. They can play with toys at home though. “The dogs live very disciplined lives, they sacrifice a lot to help us,” said Han.When Han took classes at university, her classmates liked Ersi very much. The dog quickly became the most popular “student” in class. “But she snored, and I felt embarrassed, because the professor thought it was a student,” laughed Han. Ersi was the fifth guide dog in Shanghai and served eight years before Han’s second guide dog An’an arrived last April on Han’s birthday. Ersi retired then but Han didn’t want to send her back to the center. When guide dogs retire, they can be adopted by volunteers or go back to the center. Their users are given priority to adopt them. Han’s father had had a pet dog for 15 years. He hadn’t wanted another after it died but agreed to take Ersi. An’an, another 2-year-old female Labrador, now accompanies Han every day. Unlike Ersi, who was smart, agile and independent, An’an, stable and calm, is very closely attached to Han. Han, as one of the first guide dog users in Shanghai, experienced the changes regarding guide dogs in laws and regulations as well as their public reception. Guide dogs face a number of obstacles when leading the way for their blind owners. Unleashed pet dogs are very hazardous, as they can disturb and even harm the guide dogs. Ersi was once bitten on the ear by another dog. “This is much more dangerous than obstacles on the sidewalk, dogs can lead us to go around them, but they cannot get away from the threats posed by unleashed animals and can even become disoriented,” Han said. An’an guides Han Ying to her car. Guide dog users are also concerned about people who want to give the dogs a treat. Even though the dogs are trained to refuse food, they can still sometimes break the rules and the owners cannot see and stop them in time. As of 2009, guide dogs weren’t allowed on any public transport and there were too few of them, but that changed as more guide dog users appealed. In Shanghai, Han and Ersi were able to take the subway by 2010. 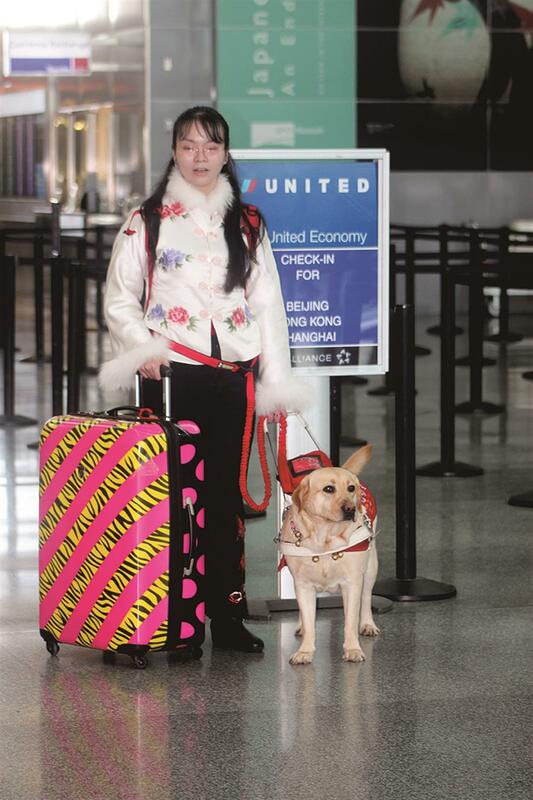 The Civil Aviation Administration of China permitted service dogs on planes in 2009. In 2011, Han traveled abroad with Ersi to the United States. She flew with China Eastern Airlines, but things didn’t go smoothly at first. “The cabin door closed right in front of me, I arrived at the airport four hours in advance and I had all the proper paperwork, but the captain refused last minute, saying the dog wasn’t muzzled, but they didn’t tell me earlier, otherwise I would have gone to buy a muzzle,” Han said. It was the first time the airline in Shanghai had dealt with such a situation and Han was asked if she was willing to take a foreign airline. But she wanted to travel on a Chinese airline. She didn’t get angry but kept calm in discussion with the airline and, eventually her patience was rewarded. Two days later, she and Ersi boarded the same flight to US. She was the last passenger to enter the cabin and all the crew and passengers welcomed her and Ersi. Since then, she has traveled with the airline with ease. The founder of Sound of Light Barrier-free Film & TV Culture Development Center, Han is devoted to creating audio description films for the blind and visually impaired people so everyone can enjoy going to the cinema. And as an advocate for the visually disabled community, she travels frequently with her guide dog to attend various events. “For people who aren’t accepting guide dogs, I always explain in patience to clear the misunderstandings and solve the problems.” Han said.